Card Text Action: Heal 3 damage from a creature. 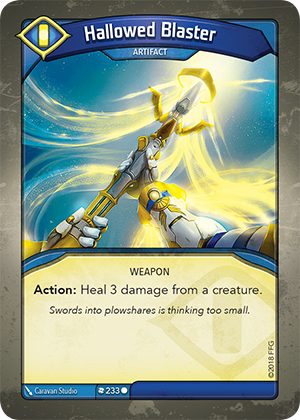 Flavor text Swords into plowshares is thinking too small. If I use Hallowed Blaster’s “Action:” ability and there are no friendly damaged creatures, do I have to choose a damaged enemy creature to heal? Can I use Hallowed Blaster’s “Action:” ability if there are no damaged creatures in play (for effects like “Each time you use an artifact, gain 1 Æmber”)?